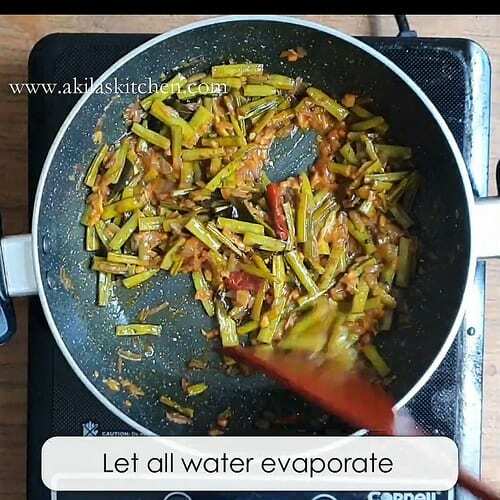 Kothavarangai Poriyal | Cluster beans stir fry recipe with easy step-by-step instructions and a video recipe for your easy understanding and learning. 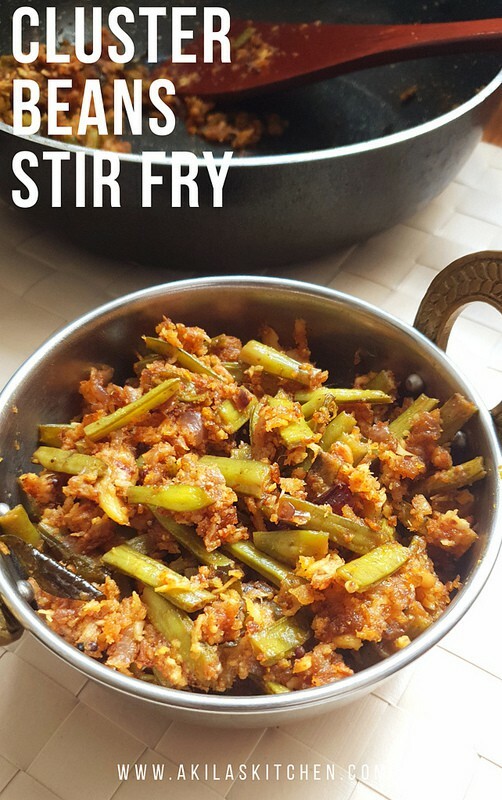 This Kothavarangai Poriyal | cluster beans stir fry recipe is different from normal stir fry recipes and I can say that your kids definitely love this stir fry. but if you’re allergic to peanuts then please avoid them and go with adding coconut alone. 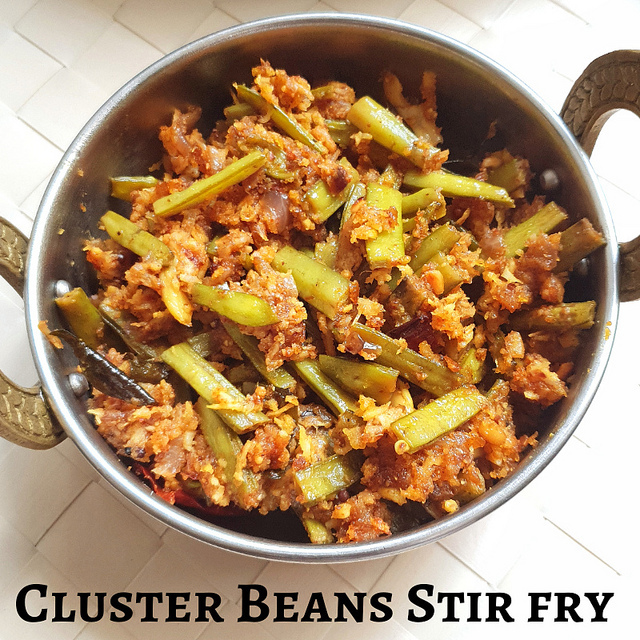 If you add only coconut then also this cluster bean stir fry recipe tastes equally good. But the crunchiness of the peanuts absent. 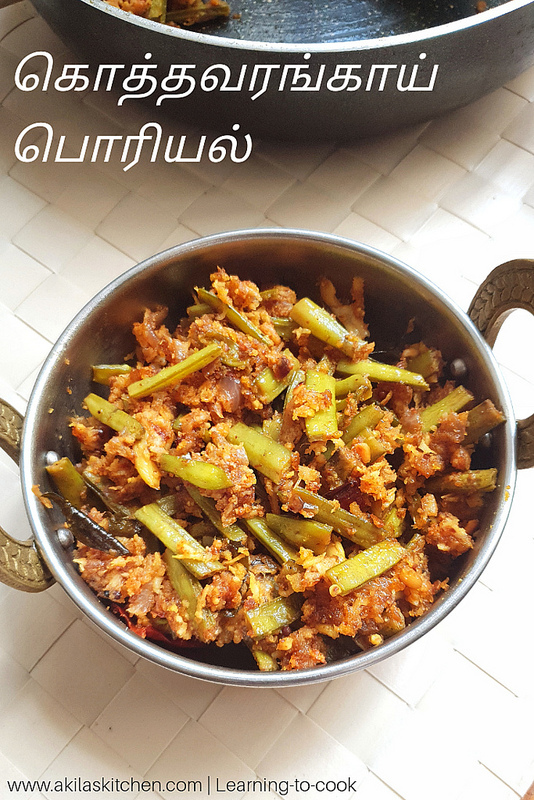 This Kothavarangai Poriyal | cluster beans stir fry recipe becomes a good accompaniment for any kind of main dish like Sambar rice, rasam rice or even with chappathi or dosa. 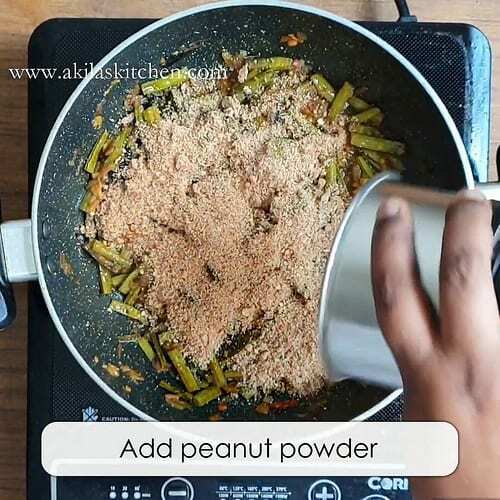 My kids who doesn’t eat the peanuts normally also loved this recipe because of the peanut powder and they enjoyed the recipe well. 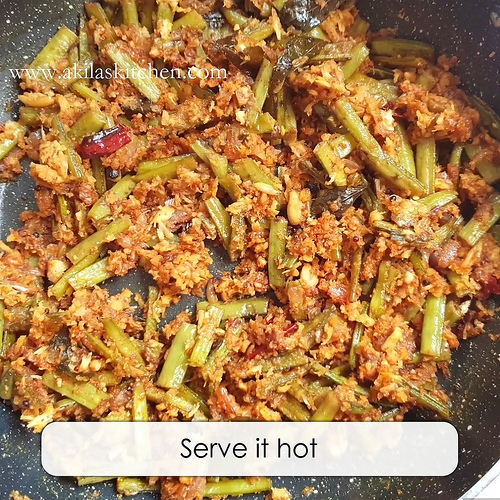 Kothavarangai Poriyal | cluster beans stir fry recipe is different from normal stir fry recipes and I can say that your kids definitely love this stir fry. but if you’re allergic to peanuts then please avoid them and go with adding coconut alone. This Kothavarangai Poriyal | cluster beans stir fry recipe becomes a good accompaniment for any kind of main dish like Sambar rice, rasam rice or even with chappathi or dosa. 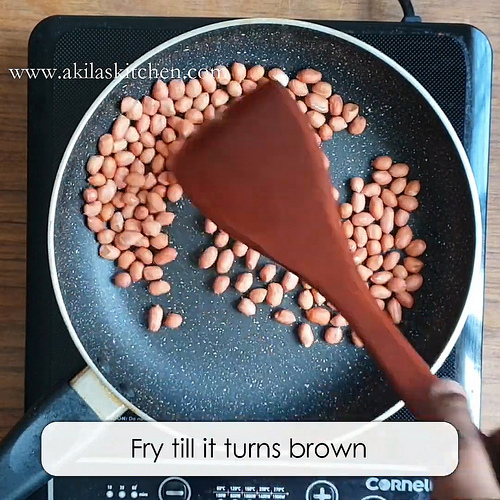 Dry fry the peanuts in a pan until it turns light brown colors. Do not over fry it. Once it turns to Brown allow it to cool down for about 5 minutes. transfer it to your food processor. grind to a coarse powder. Do not over grind it as it may start to leave out oil. 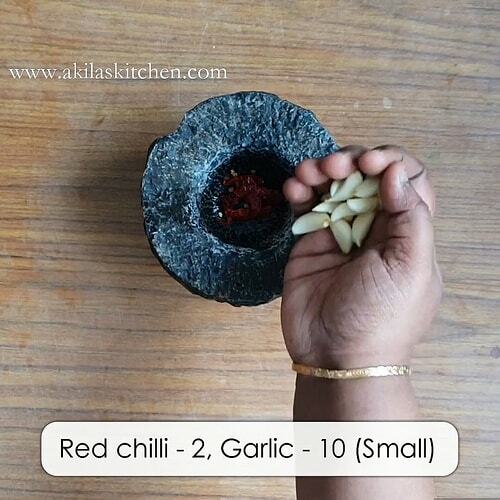 Using a mortar and pestle crush the red chili and the garlic. 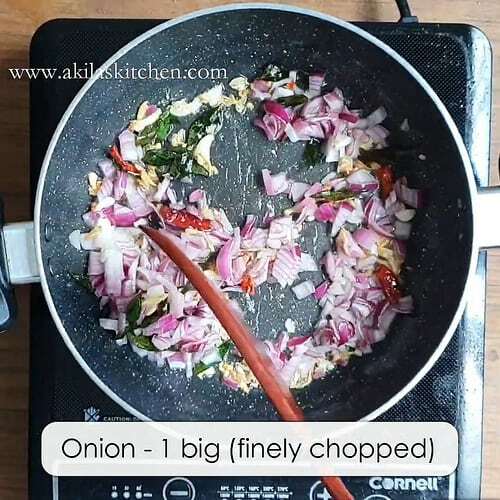 Once it is hot, add the items under tempering one-by-one and fry for a minute. Add the crushed garlic and the red chili and again fry for about 2 minutes. Onions are now added and saute them really well until it turns translucent. Now add the chopped cluster beans and saute for a while. 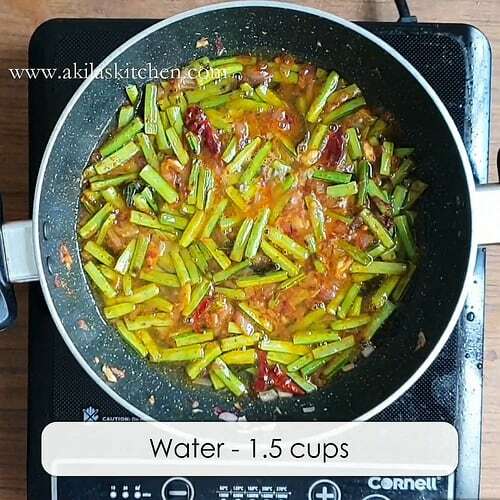 cover and cook for about 10 to 12 minutes or until the beans are fully cooked. 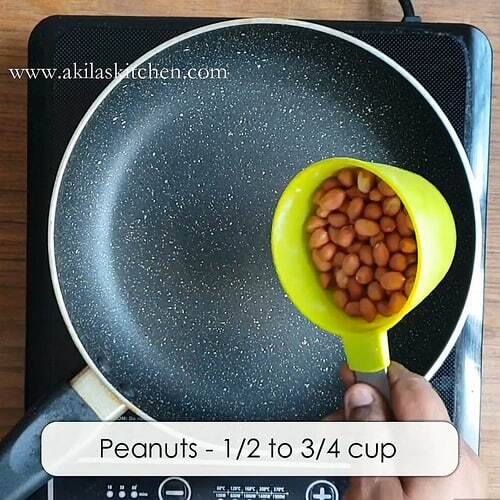 Once the beans are well cooked, remove the lid and let all the water dry out completely before adding the peanut powder. 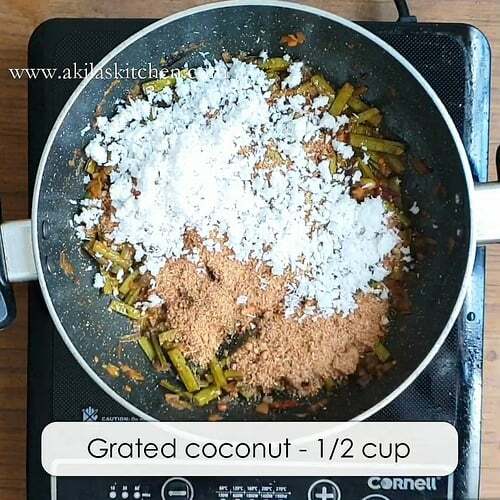 Now add the peanut powder and the grated coconut and give a nice mix for another five minutes of time and switch off the flame. Once it turns to Brown allow it to cool down for about 5 minutes. transfer it to your food processor. Using a mortar and pestle crush the red chili and the garlic. If you do not have the mortar and pestle, grind in the food processor just for about 5 Seconds. 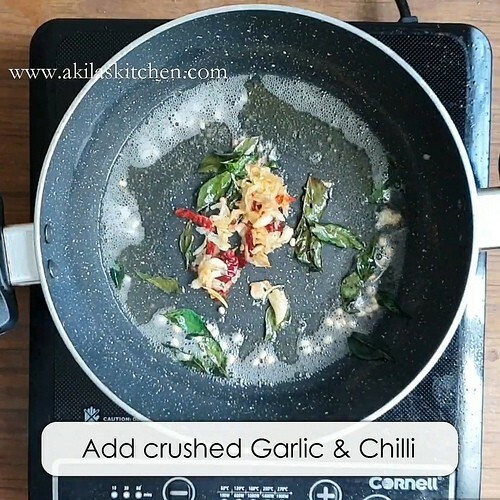 The garlic and the chili should be of very coarse one so that it tastes good in the recipe. 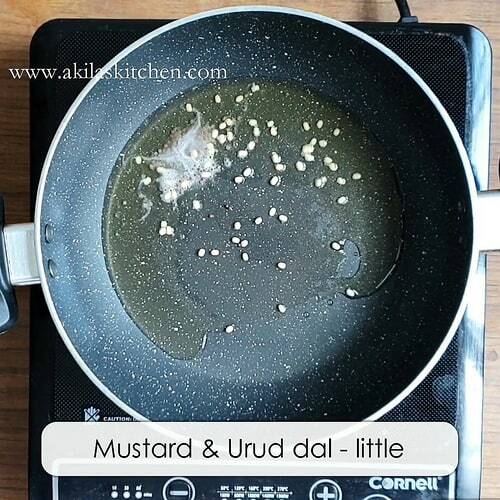 Now in a kadai, add oil. 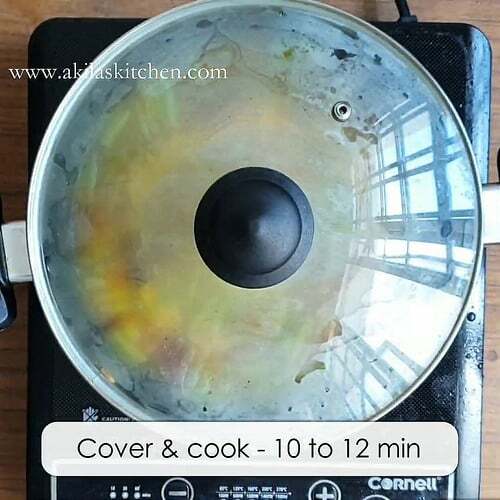 Once it is hot, add the items under tempering one-by-one and fry for a minute. 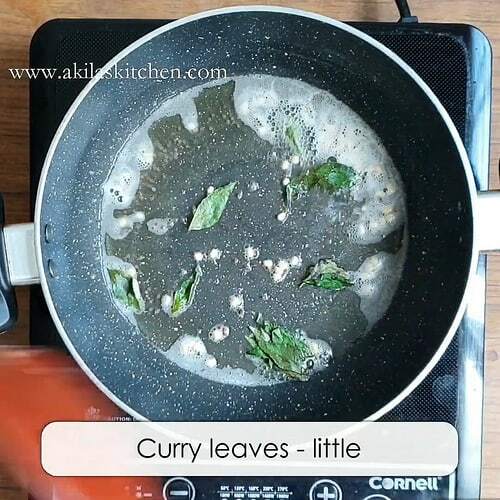 Add the chili powder, coriander powder, turmeric powder and the required amount of salt and give a nice mix so that they are coated well. 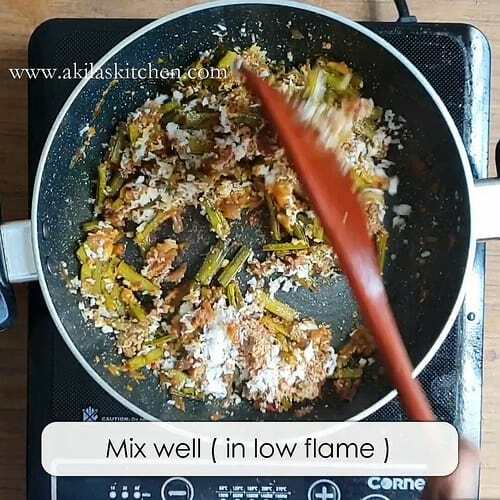 Cook the beans in medium flame and open the lid and mix it now and then so that it doesn’t stick to the bottom. 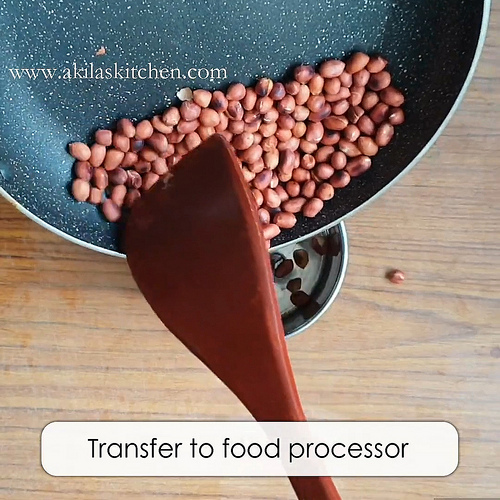 Once the beans are well cooked, remove the lid and let all the water dry out completely before adding the peanut powder. This is done because once the peanut powder is added then it becomes like a paste and mushy. In order to avoid that the water need to be completely dryout. 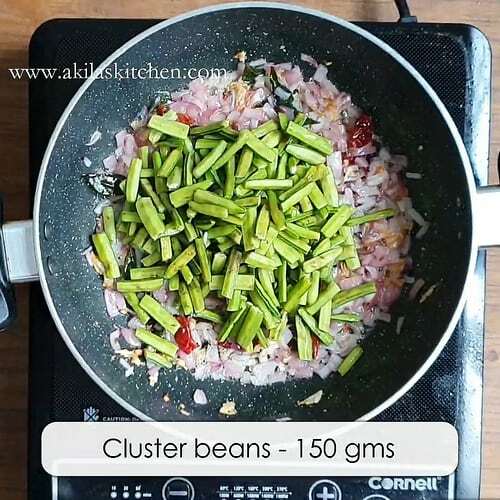 Tasty and delicious cluster beans stir fry recipe is ready to be served. 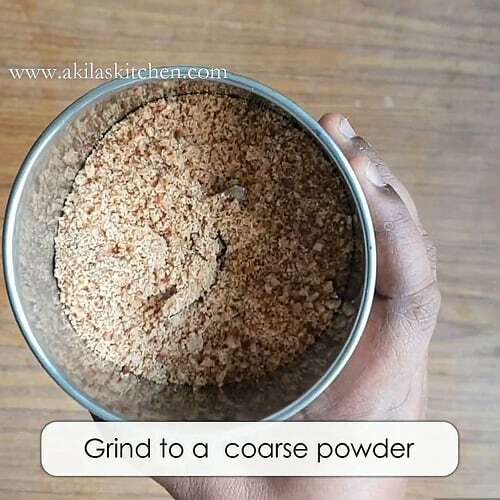 Once the peanut powder is added, keep the flame to low and mix, as it may stick to bottom. 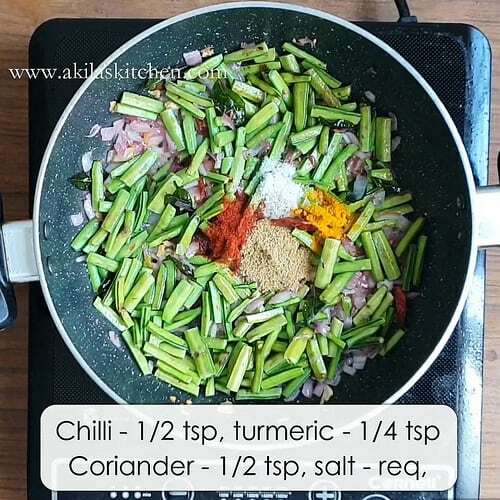 You can increase or decrease the amount of chilli powder as per your spice level. 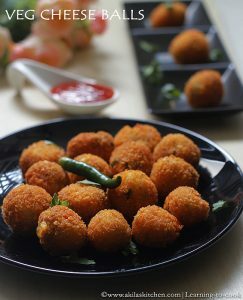 Try to use gingelly oil or coconut oil for this recipe, as it gives rich taste. If you are allergic to peanuts, you can skip and add coconut alone.